I have been thinking about a card to make for AAA Cards Birthday Bash from few days. I wanted to make it little different yet CAS and sobar. CAS Cards are more difficult to make than regular cards. You have to use minimal supplies and make the look elegant. Today is the last day for entering into AAA Cards Birthday Bash and i don't want to miss that. I have made a card wishing them a very happy birthday and many more years of success. I think birthdays are incomplete without Balloons, cakes and gifts. For this card, i made a gift box from kraft cardstock. I made it like it has just opened and balloons are carrying the cake upwards in the sky and sequins are popping from the box like bubbles. Balloons and cake are colored using Zig brush pens. That is all for the card! Balloons, cake and gifts sound like the ideal recipe for a fabulous birthday! 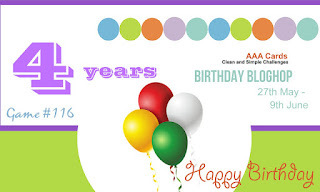 Thanks so much for creating this super card for AAA Cards 4th birthday. Great to see it linked up at Uniko too. Aww thanks so much Jane! Yes Maaike its floating your way. Thanks so much for appreciating! 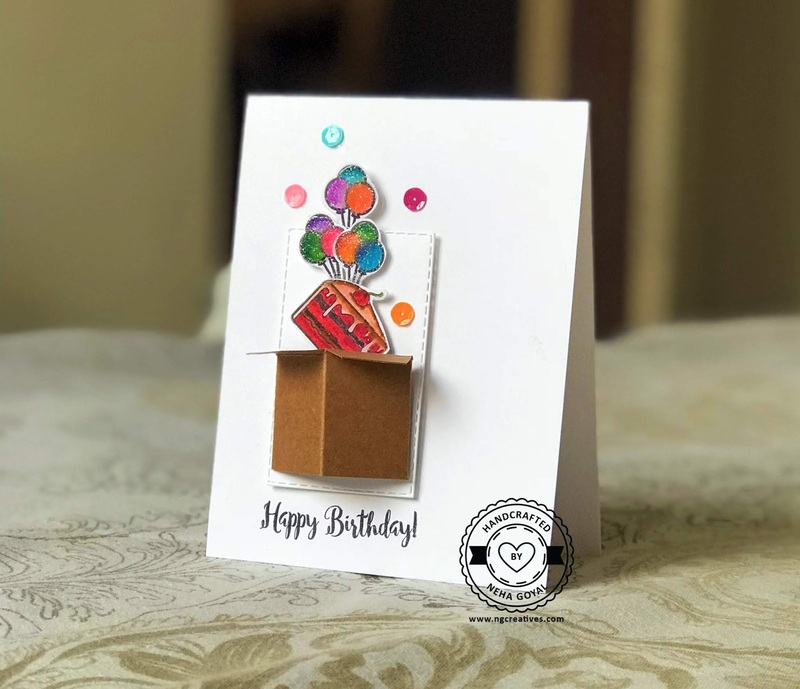 Wow, it's a creative card for celebrating someone's birthday! Thanks for playing along with us at CAS Colours & Sketches this week. Hope you can come back with us again. This is a super fun birthday card! Love the way the balloons are bursting out of the parcel! Thanks so much for playing along with our inspiration photo challenge at Uniko. Deborah, DT. Thankyou so much Debroh for appreciating! How cute is that?!! Love the little box of birthday cheer! Fun card, thanks for sharing with us at CC&S. Thank you so much Patricia! I am glad you noticed all the little details. Wow ! A very creative card with a beautiful dimension and still CAS ! A fabulous birthday card. Thanks so much for sharing and for playing along at Uniko. Thankyou so much Izzy Scrap.! Neha, so use a box instead of a suitcase to put in all the things you need for a great birthday celebration is so clever! Thanks for sharing your dimensional card with us in the Uniko Photo Challenge.